With Halloween rapidly approaching, you know I can’t help but post tons of Halloween themed articles. What’s up today? Witch, please; it’s all witches. 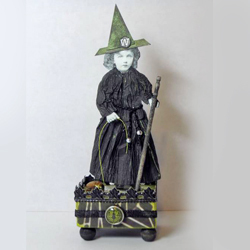 pottermouth created the perfect little witch and set her on an altered block of wood. Best part? Her pet beetle on a leash. 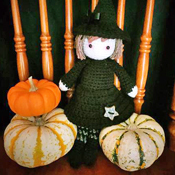 Here’s a sweet witch doll, all dressed up for Halloween. La Chapa crocheted this little cutie. 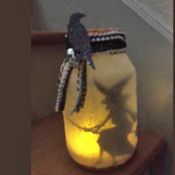 kittykill captured a small witch and placed her in a mason jar to create this spooky luminary, one out of a set of three. 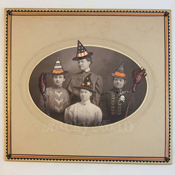 I had to get in on the witchy fun and alter a vintage photograph, giving everyone witch hats and broomsticks. Now it’s a photo of a coven! Caution! 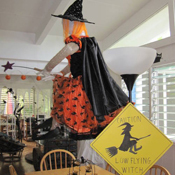 yoopidou made a low flying witch to haunt her house. I love that warning sign. Maybe I’ll take a break from posting more Halloween articles for a while. Now if you believe that…witch, please! I love everything about this roundup!